Elements Applied: Flowers and leaves are commonly applied in herbal medicine. Pyrrolizidine alkaloids, such as supinine, amabiline, intermedine, and lycopsamine, which also give base to acetyl components. Used For: The remedy is used due to its capacity to induce lactation, perspiration, and urination, stimulate the body and its nervous system, treat coughs and inflammations. Borage helps restore adrenal cortex, especially in case where a medicinal therapy with steroids or cortisone was applied to the glands and damaged their functionality. 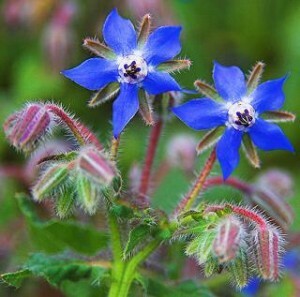 The increasing demand for the medicines which will help the gland cope with the load imposed on it, makes borage an ever effective remedy for both topical and oral application. Borage can be applied to stimulate the adrenal glands for a certain period. It is especially beneficial when one recovers from a long-term disease and in case of fevers. Borage is believed to reduce inflammations, particularly in diseases like pleurisy. Seeds and leaves are utilized to increase lactation in breastfeeding women. Borage is rich in calcium and potassium. Additional Info: Borage belongs to annuals and can be found in the Mediterranean countries where it originates from. It is specifically raised in many other countries. The stem has many branches and may reach two feet in height. The leaves are oval and bristly, with the majority of them growing on branches and stem, and having alternate position. The flowers appear through summer and are commonly purple and blue-colored. Preparation and Intake: To make an infusion take 2 teaspoons of dry herb’s extract and fill it up with 250 ml of boiling water. Steep for 15 minutes. The result is taken thrice a day. In form of tincture the plant is taken in a dose of 1-4 ml thrice a day. Safety: The plant is not suggested to take for a long-term period. There is no further data concerning the plant’s safety level.